Students from Hutt Valley schools, and perhaps some from further afield, were yesterday treated to a presentation at Hutt International Boys School by Christopher Paolini, author of the Inheritance Cycle series. Christopher told us a little about his early childhood - he really did not want to learn to read, he even told his mother he "hated reading". At about age 5 he experienced a complete switch and became hooked on reading. The culprit was the first book he ever borrowed 'by himself' from the library, he doesn't remember the exact book but recalls it had a bright appealing cover and was a detective type story where tomato sauce was mistaken for blood! Christopher was Home Schooled and after graduating at age 15 he became quite bored. He dug a 2 metre deep hole in the backyard and using an abandoned satellite dish, hay bales and hunks of tree bark he created his own Medieval Mead Hall accessed via a tunnel. He realised he needed something to keep him occupied, other that digging holes, this is when he started planning the Inheritance Cycle books. Christopher read favourite passages from each of the four books, briefly explaining why he liked them and then it was question time. Earlier we'd heard that Eragon (the character) wasn't always called Eragon, at first he was going to be called Kevin! During question time we found out that originally, when Eragon (the character)was called Kevin, Eragon (the book) was called Inheritance. We also discovered that he spends quite a lot of time online gaming - once he challenged someone who logged on as Eragon, unfortunately they were better than him and when he lost the game "You have been killed by Eragon" flashed across the screen. My favourite Q & A was about where he got the idea for the Razak. 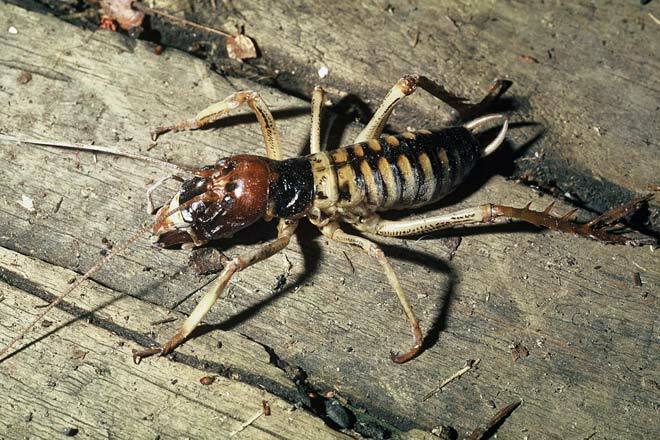 It turns out this idea came from the Potato Bug or Jerusalem Cricket found in Montana - Christopher described it as looking similar to the Weta found in New Zealand only smaller. One night he took a torch to investigate the horrible noise coming from another room in the house .... he discovered a huge ugly black monster - the larger than life silhouette of a Jerusalem Cricket that was sitting on the back of the couch! These two bugs look pretty similar to me too. 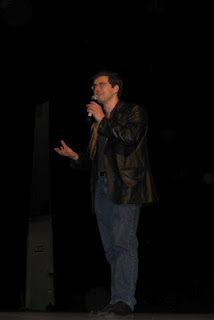 You can find out more about Christopher Paolini here or you can watch him talk about the Inheritance Cycle books in an earlier blog post here. P.S. 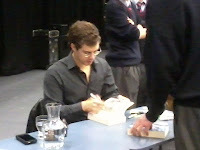 You can also read a recent interview with Christopher Paolini in Christchurch - here.